The Victoria Police Department is the oldest police force west of the Great Lakes. Today, the Department is responsible for policing the core area of the capital city of British Columbia. Greater Victoria has a population of well over 300,000 residents. The city itself has a population of approximately 80,000 residents and Esquimalt is home to another 17,000 residents. In July of 1858, Governor James Douglas appointed Augustus Pemberton as Commissioner of Police and authorized him to hire “a few strong men with good character.” This colonial police force was referred to as the Victoria Metropolitan Police, and was the forerunner of the Victoria Police Department. Prior to this, policing had evolved on Vancouver Island from an armed militia style of force known as the “Victoria Voltigeurs” through to the hiring of one single “Town Constable” in 1854. 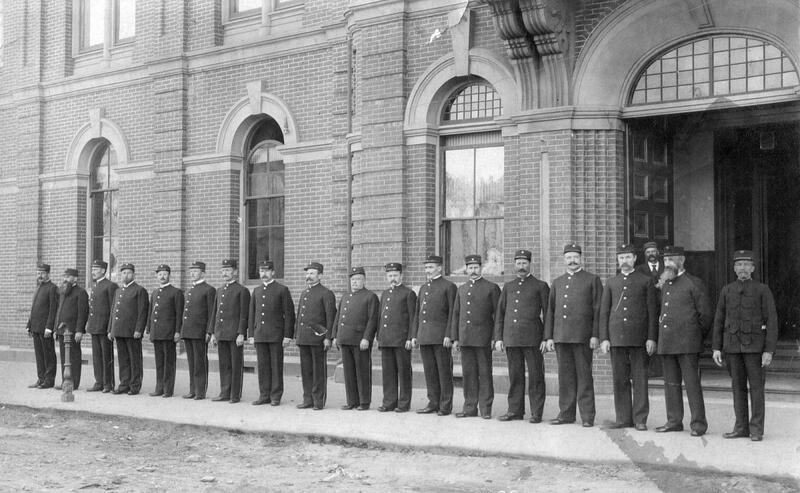 In the year 1860, this fledgling Police Department, under Chief Francis O’Conner, consisted of 12 constables, a sanitary officer, a night watchman, and a jailer. The original police station, gaol and barracks were located in Bastion Square. The men wore military style uniforms, carried batons and were only allowed revolvers when they were given a warrant to serve. In the early days the kinds of offenses the police officers had to deal with consisted mainly of drunk and disorderly, assaults, deserters and vagrancy. In addition, people were charged with being “a rogue and a vagabond” and also with being of “unsound mind”. Furious driving on public streets and impaired driving of horse and wagon were also fairly common. In the 1880s, under the direction of Chief Charles Bloomfield, the police department moved to new headquarters located in City hall. The force had increased in number to 21 officers. Under the direction of Henry Sheppard who was appointed Chief of Police in 1888, the Victoria Police became the first police department in western Canada to use photographs (mug shots) for criminal identification. In January, 1900, John Langley became Chief of Police and in 1905 he acquired a horse-drawn patrol wagon. Prior to this, offenders were either taken to gaol in “hired hacks” or “dragged down the street”. Chief Langley and his officers had to deal with various types of crimes and complaints. For example: Emily Carr, a renowned Canadian artist, laid a complaint regarding boys shooting in her yard and she wished it stopped; A resident reported that his neighbour kept a cow in the basement and the bellowing of the cow disturbed his family, and allowing thistles to come to flower was an offence and officers were instructed to “keep a sharp look-out.” By 1910, there were 54 men in the department which included officers, gaolers and desk clerks. Officers on the beat covered an area of 7 and 1/4 square miles. In 1918, John Fry became Chief of Police. Chief Fry requested and received the first motorized patrol wagon. In addition under Fry’s administration, the police department moved to their new police station located on Fisgard Street. The building was designed by J.C. Keith who also designed Christ Church Cathedral. In the early years, the Victoria Police Department was responsible for policing the County of Victoria on southern Vancouver Island. In those days, B.C. had a provincial police force, before the Royal Canadian Mounted Police was established. 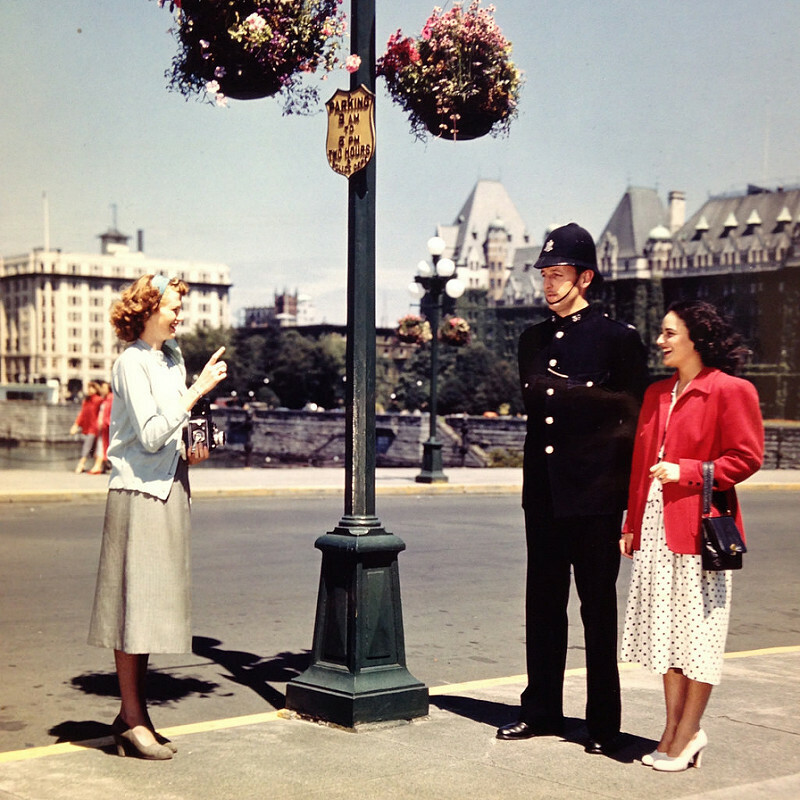 As local areas became incorporated, the Victoria Police Department re-defined its area to what is now the City of Victoria and the Township of Esquimalt. VicPD members have distinguished themselves in military service, both to their community and their country. In 1984, the Victoria Police recognized the need to keep up-to-date with technology and began a process of automation that continues to this day. This has resulted in the implementation of a state of the art computer system which has automated the records management system and is linked to a Computer Aided Dispatch system complete with mobile data terminals in the vehicles. These terminals allow members on patrol to access information contained in the Department records system as well as connecting to the Canadian Police Information Centre in Ottawa. The Department also has a computerized Mugshot System that will link directly to the Departments automated records system. Victoria was also a national leader in community based policing during the 1980’s. VicPD opened its first community sub station in 1987, in James Bay. Other stations opened in Blanshard, Fairfield, Vic West and Fernwood in the next two years. These stations, operated by a sworn member and volunteers are vital link between the community and the police who serve them. The locations of the stations have changed over the years, reflecting a continuing commitment to providing the best possible service, while working within the constraints of tight budgets. While the system of small satellite stations no longer exisist, we have retained a dedicated strong group of volunteers that are the heart of our Community Policing Programs. In 1996, under the command of Chief Douglas E. Richardson, the members of the Victoria Police Department moved into a new state of the art $18 million dollar facility on Caledonia Ave. In 2003, the Esquimalt Police Department amalgamated with the Victoria Police Department, and today VicPD proudly serves both communities. The current Victoria Police Department, with a strength of nearly 400 employees serve the citizens of Victoria and Esquimalt with a high degree of professionalism. Amid rapidly changing attitudes, advancements in technology and social changes, police service has been continually challenged. Members of the Victoria Police have met those challenges. For 150 years, this force has served with dedication, leaving behind a colourful and at times controversial history.